We often tell customers that there is a sale everyday at Trendy Repeats. We aren’t kidding when we say that. Besides the storewide sales, product type sales, holiday sales, etc. we also have discounts on the tag color. Every day we also have discounts for checking in on Facebook, military (with ID) and senior citizen Thursdays. The first tag color board is located at the entrance before you walk into the store. We have this board outside the store during good weather. 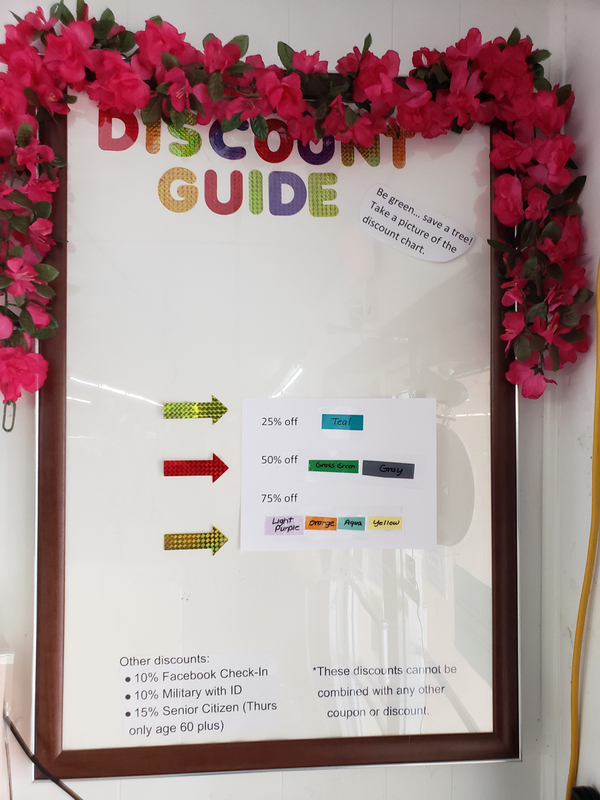 This board notifies many new customers that there are discounts associated with the tag colors. Another sale board is located inside the door to the right. This board lists tag color discounts and the other discounts we have available. In the center of the store by the shoes is another sale board that displays the discounts on both sides of the pole. We encourage guests to take a photo of the tag color boards to carry with them for reference.